When you think about meditation or mindfulness, what images come to mind? Do you think of a monk or yogi sitting cross-legged in deep contemplation? Whatever comes to mind there’s one thing for sure – meditation has been around for awhile. Archeologists discovered wall art in Indus Valley (India) that dates back to 5000 BCE. These images portray people sitting in a meditative posture that is similar to the postures that we still see monks adopting today. They have their legs crossed, their hands are resting on their knees and eyes open slightly. This is referred to as a typical eye-open meditation. Did these people create meditation? It’s hard to say. But the fact that it has been around for so long indicates that it has been in practice for at least 5000 years. So why would people have needed to meditate so long ago? Surely they didn’t suffer from being overstressed like we do? I think the answer is more simple than that. From all accounts, meditation was first used as a spiritual practice. It was a way to connect with your spirit so that you could become one again with the source of your existence. Some refer to this as a path to enlightenment. Meditation was something that was passed on from master to disciple as an initiation into self-realization beyond the human potential. Then, they spent the majority of their life meditating to enter a state of Nirvana, or blissful like existence with the Universe. Well, that’s a hard question to answer as we’d need to talk to every student that ever meditated. There had to be something to it otherwise, why has meditation endured for such a long time? I’ll actually keep this relatively short. The essence of meditation has not changed. there are still millions of people around the world that meditate as part of their daily spiritual and sacred practice. The difference these days though is that Western societies have become so cerebral in their lifestyles that they have turned to meditation to get some relief from their own heads. It’s no wonder we’re so stressed out all the time and people find it hard to stay focused or get a good nights sleep. The times we live in now are massively distracting and disruptive.The result of this is that our nervous system is always in a state of overload. That’s why meditation has become mainstream. People need it to both slow down for a few minutes each day as well giving themselves some much-needed time-out to clear their head and re-focus their mind. To me, meditation is all about energy. It’s like taking a dip in an oasis in the desert when you feel like you can’t take another step because your body is so tired and dehydrated. Then, when you dive into the water you feel instantly refreshed and rejuvenated. This is exactly how I see meditation. It’s taking the time each day to dive into a space of peace and calm within yourself. When you do that, then it makes the rest of your day seem to flow so mush more easily because your mind is clear and your body is recharged. Meditation is an ancient gift to the people of this planet that I don’t believe we will ever know the true origins of. One thing I know for sure though is that the need for people to de-stress and let go of the craziness of their lives from time-to-time is not going to go away anytime soon. It’s great to see meditation being embraced by more people who use technology because it makes it so much simpler for anyone to learn to meditate anytime and anywhere. There are meditations that range from 30 seconds to an hour which can now be practiced just by tapping on an icon on your smart device. Who knows what the future of meditation will be but for now let’s just enjoy what’s already here. 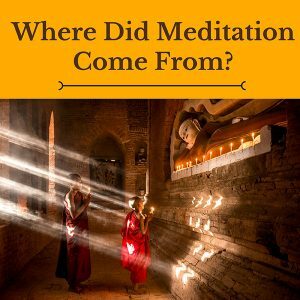 https://www.meditationdojo.com/wp-content/uploads/2016/10/Where-Did-Meditation-Come-From-Featured-Image.jpg 343 800 Michael Atma http://www.meditationdojo.com/wp-content/uploads/2017/01/Meditation-Dojo-2017-5-300x77.png Michael Atma2016-10-25 07:16:022016-10-25 08:02:55Where Did Meditation Come From?